Colton Haab is a junior at Marjory Stoneman Douglas High School in Parkland, Florida. 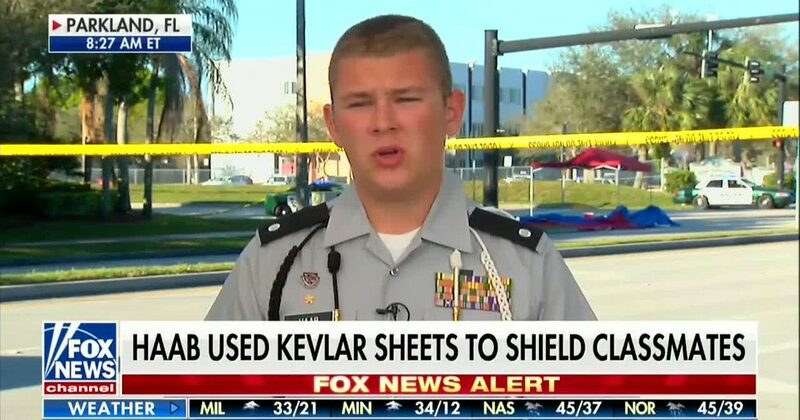 He is being recognized for his heroism in leading a group of 90 students to safety and shielding them with Kevlar mats for protection from the bullets of Nikolas Cruz. Haab was invited by CNN to attend a town hall meeting to discuss the horrific event and ways to prevent future tragedies. He was asked to prepare questions in advance and to ask his questions at the town hall event. Except it didn’t work out that way. Habb was given scripted questions by CNN, which he refused to ask, declining the invitation to attend the event. “CNN had originally asked me to write a speech and questions, and it ended up being all scripted,” Haab continued. In a Thursday morning tweet, CNN denied having scripted questions for Haab or anyone else, which means someone is lying. I can’t vouch for the truthfulness of Colton Haab, but CNN is well-known for being less than honest nearly all the time and spinning every broadcast with a decided liberal slant. Nearly all of the responses to CNN’s tweet agree that CNN has no credibility. Calling a hero that saved lives a liar, not a good look! I don't know Colton Haab well enough to vouch for his truthfulness, but I do know CNN as a steaming pile of dishonest, biased, leftist fake news. ZERO credibility! Don’t believe a word @CNN says. They love to Lie, twist, and misinterpret information. #FakeNews HeadQuarters!